Is it Wednesday, again… already!?! We have received so many new things this week, it was hard to make the choice for what to feature (lamps, wall décor, furniture), but here it is…..
We just received 6 of these custom made dining chairs. The fabric is brand new and this is the first time these chairs have been built. The top of the chair has a nice classic, camelback arch. There are bronze nailheads on the sides and at the edge of the seat. The legs are solid wood in a dark brown stain. 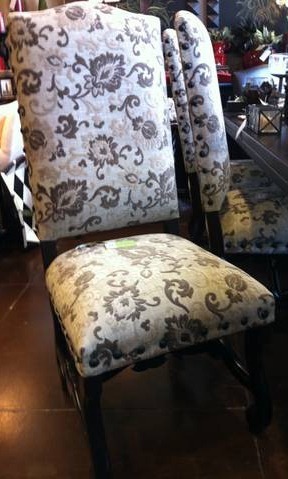 The chairs are $595 each and would look great in a transitional or traditional dining room. The fabric has a raised velvet pattern in cream, taupe and gray. The background is a neutral cotton/linen blend in a light linen color. The chairs look very rich and would go a long way to making any dining room look fabulous!